We owe last night’s dinner — or at least the inspiration for it — to my friend, Marthe Teunis. No, she didn’t fly to Ohio from The Netherlands to cook for us (but how cool would that have been?). But she did choose empanadas from Bake! for our next group baking recipe. For some reason this recipe took me forever to get around to making. I bought the ingredients, put them away, got them back out, and on and on. I made the puff pastry with Nick’s amazingly simple and delicious recipe (also in Bake! 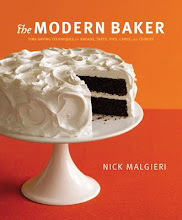 — you really should get this book) two weeks ago and put it in the freezer when I realized I wasn’t going to get around to making the empanadas that weekend. Then last week I made the chicken picadillo filling and again ended up putting it in the freezer as the timing didn’t work out. I got both the pastry and filling out of the freezer this past weekend, thinking I would make the empanadas on Sunday. I finally got around to baking them for dinner last night (Monday). Fortunately, with the filling and puff pastry done, it was really just a matter of assembling everything. 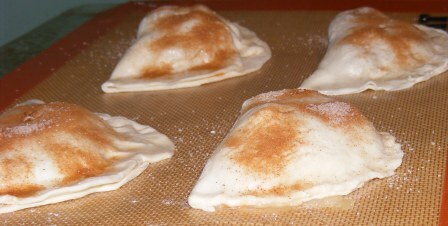 Of course, I couldn’t make things too easy, so I decided to make a few different empanadas. I had some Portobello mushrooms and canned chicken, so I made a sherry-mushroom-chicken filling. And I had a can of apple pie filling for caramel apple empanadas. The dough rolled out beautifully, and the empanadas came together quickly. 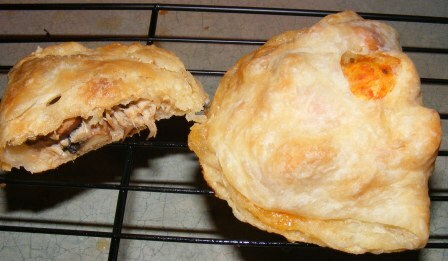 I made the two savory varieties first and then threw together the apple empanadas while the first batch was in the oven. The savory empanadas were both delicious. I started with the mushroom and chicken version and was pretty sure it would be my favorite. Then I tasted Nick’s version, and it was amazing! The filling was mildly spicy and blended perfectly with the buttery, flaky crust. The caramel apple empanadas were good, too, but not as good as the savory versions. I probably should have baked them a bit longer or at a slightly higher temperature. The taste was fine, but they weren’t as crispy as I would have liked. Nonetheless, I am sold on Nick’s version of empanadas. The puff pastry is perfect, and the filling possibilities are almost endless. I definitely want to try the ground beef version in the book. And I could see keeping extra filling in the freezer for an easy weeknight dinner. Some of my Twitter friends made these, too. Check out these posts by Abby, Andrea, and Kayte. These look and sound great, it was nice to hear about the different versions you made. My only problem was that mine got too dark around the edges, so am wondering how you all did that as none of yours (Abby’s and Andrea’s) were dark around the edges like mine. Hmmm…other than that, they were great. The chicken filling was very nice…I am going to try them with beef very soon as the guys wanted them again to try that version, even though they liked the chicken just fine, so am thinking they just want me to make these again as they really liked eating them. Yours look wonderful. Thanks, they were really good. I wonder if you pressed your edges a little thin and that’s why they got too dark? I guess you’ll just have to try again. The guys will be happy. These look great! I agree – the filling is amazing and makes a nice dinner with some rice or potatoes! Or even as a stew it is great! We loved the filling over rice. In fact, I might make it some time just to serve it that way. You should really try them. They were surprisingly easy to make — and so good!! So impressed with your empanadas x 3! Sign me up for one of the portobello mushroom ones, please. I may have to steal the idea for a sweet version, too…. I’m so happy I finally tried Nick’s puff pastry recipe…so easy and so tasty! Don’t be too impressed — you made yours a month ago. And I still haven’t done carrot cake, my own pick.